People around the world depend on their EpiPen to work in the case of life-threatening allergic reactions. But two people recently found out the hard way that their EpiPens were faulty. As a result, the makers of EpiPen are recalling over 81,000 EpiPens in Norway, Denmark, Finland, Ireland, Australia, New Zealand, and Japan. Mylan has not yet responded to Gizmodo’s request for comment this morning. Patients in the affected countries can reportedly exchange their EpiPen auto-injectors for new ones. Patients in the United States should consult their doctors if they have any concerns, but since no recall has been issued in the US, it’s unlikely that you’ll be able to exchange the incredibly expensive product. EpiPen came under intense scrutiny last year after Mylan purchased the product in 2007 and proceeded to raise the price by roughly 600 percent. Consumers were outraged by this price-gouging and Mylan executives had to testify in front of Congress. 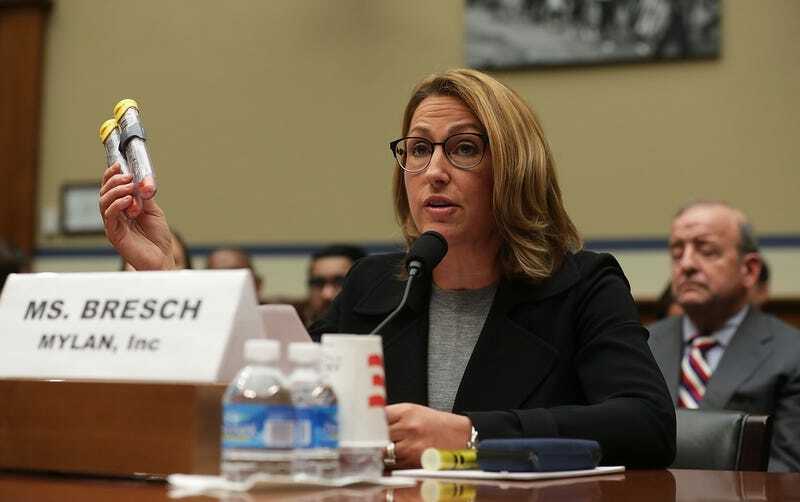 As it turns out, the CEO, Heather Bresch, blatantly lied to Congress during her testimony. The company introduced a generic for half the price in the US, (which ironically Mylan makes more money on due to America’s backwards reimbursement rates), but the generic is also not affected by the recall in the US. What’s the difference between Mylan’s generic EpiPen and the name brand product? About $300 and a different label. Otherwise, they’re exactly the same. We’ll update this post on the off chance that Mylan gets back to us or one of their executives finally goes to prison for ripping off the American people and their government. Both seem about equally likely at this point. Mylan issued a voluntary recall for one lot of EpiPen® Auto-Injectors (5FA665) distributed in Australia, New Zealand, Europe and Japan. This lot was not distributed in the U.S.
Mylan and manufacturing partner, Meridian Medical Technologies, initiated the voluntary recall after receiving two reports of failure to activate the device due to a possible defect. The confirmed reports were received from Europe and Asia Pacific. The recall is a precautionary measure.